The Test Server is private. It’s only available to you and the collaborators you choose to share your project with. When developing your website, this is where you can make configuration changes directly. All configuration changes need to be deployed to the test server first, to ensure your configuration works as intended. The Live Server is public. When you are sure that your configuration works correctly and you are ready to use it for your live website, it’s time to deploy the Live Server. Note that this applies to configuration changes only - content changes can be made directly on the Live Server. In each project’s Dashboard, each server has its own pane, with information about its status and configuration, as well as with corresponding options. There’s also an open site link that will take you to the website that is currently active (deployed) on each server. The Test Server pane displays information about the System and Boilerplate versions, as well as indicators that show whether they can be updated, in which case a button to apply the updates will be available. 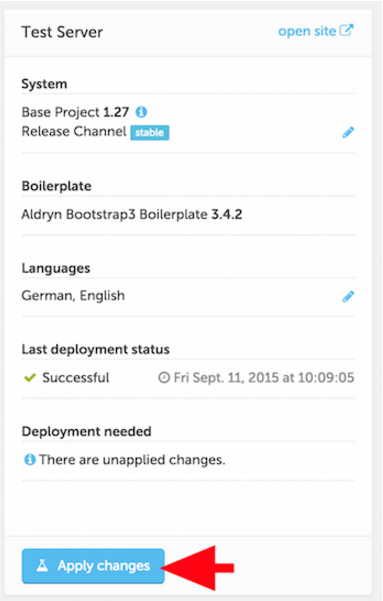 At any time, you can use the Deploy test button to deploy the current configuration, whether it has been previously deployed or not. When there are unapplied changes that need to be deployed on the test server (such as an updated Addon, for example), then you will see an Apply changes button instead. The Test Server provides you with a complete Divio website, with all its functionalities. However, the site remains private, available only to you and the people you have shared it with. To publish your site for the world to see, you need a Live Server. The Test Server is also paused after 15 minutes of inactivity in order to save resources. It gets automatically wakened when visiting the test URL or when re-deploying. If your site shows a "Site is not ready" message, simply re-deploy the test server to get it up and running again. Test servers always run on one container independent of your subscription options. The Live Server allows you to make your website public and associate your own domain name with it. When you are ready to make your site public, hit Deploy Live. Once the deployment process is completed, your site will be available to anyone with your public website link and not only to the collaborators you share it with. 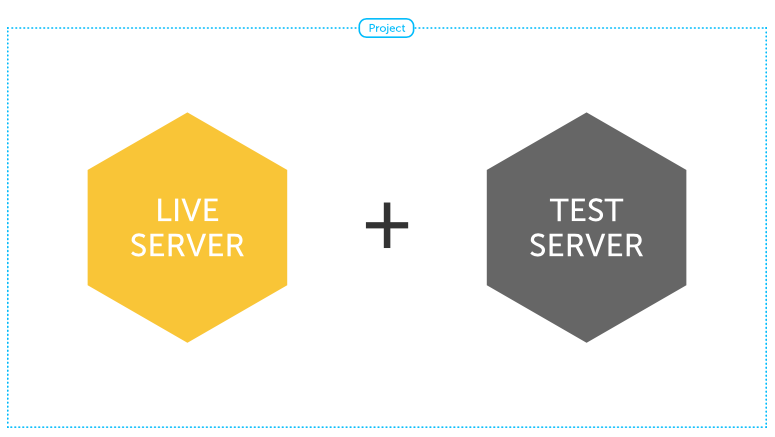 When you deploy the Live Server, the configuration that you have on the Test server will be copied to the Live Server. You can now make further changes to the Test Server, but your live site won’t be affected until you once again use Deploy Live to redeploy the test configuration to the live server. Info: When this is the case, deploying the test server to live will NOT overwrite the data that already exists on the live server. Data overwriting will only occur if the test server is copied to the live server. Warning: Please be aware that the copying action overwrites the content on the destination server. Don’t use the copy function unless you are sure you want to overwrite the content on your Live or Test sites. The Copy live data to test button will copy all site content from your Live Server to the Test Server, so that you can test new configurations with existing data. Typically, you will use this when testing an updated version of software, such as an Addon, to ensure that it will work correctly when later deployed to the live server. How you use these commands is up to you, and will be determined by your preferred workflow.